My official War Department orders for me to be assigned to my twin brothers unit had their impact on the personnel people because I was released and sent on my way to South Hampton where on June 16, 1944 I boarded a British vessel bound for Omaha Beach. This was a fairly large ship and the remarkable thing about it that below decks all the bulkheads were removed and you could see from the bow to the stern without seeing anything but me and infantrymen. It's not hard to imagine what would have happened if we had been hit by artillery or a torpedo. The ship pulled up to one of the famous Mulberry docks that had been towed from England in the first days of the invasion. My brothers unit was part of the force that had, along with other forces, penned in about 60,000 Germans who were protecting the submarine pens at St. Nazaire and Lorient. 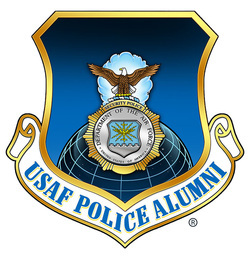 Since I was now a member of this unit with my brother I will refer to it as our unit. We were in constant action from that point onward and we were transferred to the 8th Armored Division on February 11, 1945. 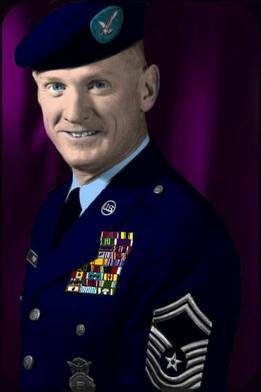 In early April we were reassigned to the 2nd Armored Division and within just a day or so were assigned back to the 8th Armored Division. On April 5th we found comfortable and dry billets in a German factory that formerly had manufactured hydrogen fuel for the German rockets. This was near the town of Bad Lauterburg. We left at about 9 A.M. on a two lane winding paved roadway. We had traveled north between 8 and 10 miles and the roadway became even more winding although it was generally gentle curves following the course of the river to our right (east). On the morning of the 23rd two of the Germans took me out and deeper into the woods until we came to a group of tents which is where these men were housed. I was given a shovel and made to dig in a designated area uncovering two or three "jerry" cans of gasoline. I was told to empty two of the cans into the gas tank of our jeep. I was able, without them seeing me, to pour some of the loose dirt at my feet into the gas tank in hopes it would dash their hopes for whatever goal they were going to attempt. Completing my job I was hustled back to the cabin to rejoin my comrades. Then I heard one shot...obviously they all fired simultaneously. In looking back on this I seem to see it all vividly but in slow motion. Weird!! I felt like I had been hit in the head with a baseball bat. My head rocked back and forth from the impact and I fell to the floor like a piece of string. I felt no pain at all but was aware that I was bleeding profusely and I thought they may have hit my jugular vein. I fell over a chair that that had been overturned on the floor and so my eyes were below their eye level . I heard one of them go over and kick Shepard and then Little and then me. I played dead. They then left, I heard the door close, the jeep start up and drive away. As the door closed Little began to moan and I hurriedly got up and put my hand over his mouth because I did not want them coming back. I do not know who all was in that jeep when it drove away. I do not know what happened to all those men in the barbed wire enclosure. Following my limited instructions my brother formed a search party of two half tracks and about fifteen men and searched until dark without success. The next morning at dawn the same party left and found Little under a bush unconscious but still alive. He later died in the hospital. I was taken to an aid station, flown to a hospital in England where they wired my jaws closed to allow healing of the compound-comminuted fracture of my upper and lower right mandible. Couldn't eat for three weeks, just soup, soup, soup. 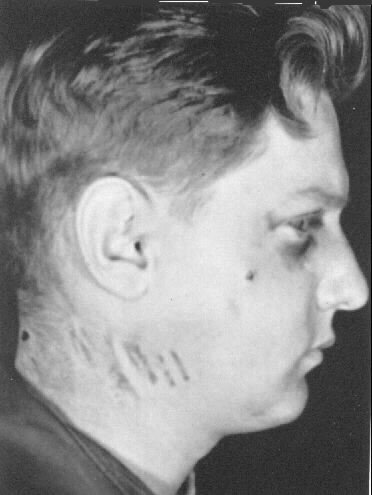 Right side profile of Frink taken at the hospital in England on the morning of April 25, 1945 about 36 hours after the incident. The entry wound on my neck and the exit wound near my right eye are clearly visible. The cabin in which CMSgt. Frinks ordeal took place. His brother took the photo and gave it to him after he recovered.